Want a portable wind turbine? Now you can have one. There's something about an iPhone plugged into a portable wind turbine that just feels right. Now, Minnesota-based Janulus has launched a Kickstarter campaign offering that and more. Featuring four types of their Trinity Portable Wind Turbine Power Station, the Kickstarter exceeded its goal of $50,000 in less than two days. Billed as "your very own power station," these small, white wind turbines have three blades, three legs, and can generate power from wind speeds as low as four miles per hour. Featuring Li-ion battery packs similar to those used in electric car technology, the turbines come with either 50, 400, 1,000 or 2,500-watt generators. According to the campaign, the 400-watt model battery, which can charge in three to four hours, is capable of charging an iPhone at least 16 times. The two largest versions come equipped with the ability to tie into the power supply of homes or RVs and feed electricity straight into outlets. Ranging in price from $399 for the Trinity 50 to $5,999 for the Trinity 2500, the mini-wind turbines are expected to start shipping in early 2016 if all goes as planned. Trinity 2500 mounted on a home. "We're the first portable wind turbine on the market," Agust Agustsson, vice president of Janulus, told me over email. "Until now the only portable solution has been solar." Augustsson, who is Icelandic, said the biggest challenge of the project was designing something that folded into a cylinder with a built-in battery, thus allowing it to be portable and lightweight. He said the largest version can in many instances power an entire home or at least put a large dent in a household energy bill. Alternatively, the smaller versions are great for camping or charging electronics. This is Trinity's second Kickstarter campaign, the first one in April of 2014, promoted an earlier, 15-watt version of the portable turbine. Augustsson said he thinks people are so interested in the product due to "energy prices" and the fact that society is getting "more environmentally conscious." He also said people are getting "more power hungry" and looking for ways to charge gadgets on the go. Agust started the company with his brother Einar. According to their recent press release "one of the best things about crowdfunding is that you get to communicate directly to the consumers and hear their ideas on how to refine and improve the product." This has allowed them to improve upon designs before starting to manufacture them. After an extended search for a satisfactory manufacturer, the brothers decided the best option was to open a facility themselves, which they did this summer in Iceland. 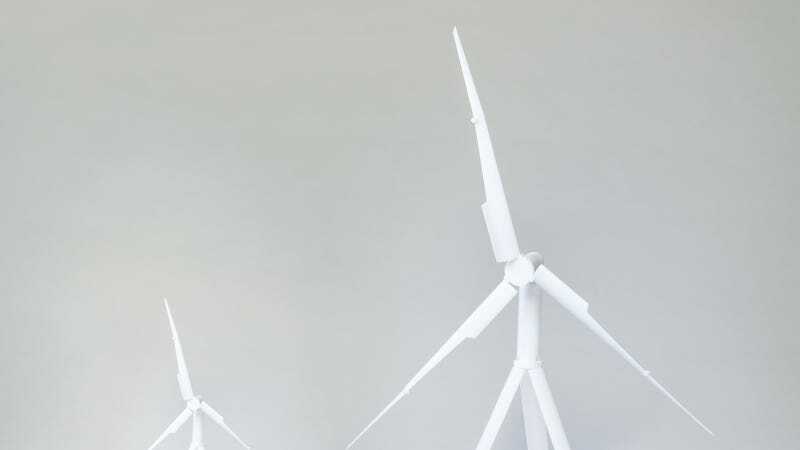 The wind-turbine prototypes were made using 3D-printing technology, but the final versions will be made of reinforced fiberglass, according to Augustsson. And if all this wasn't compelling enough, there's also a Trinity app to remotely control the turbines. As of Thursday afternoon, the Kickstarter had raised over $75,000 with 31 days to go.